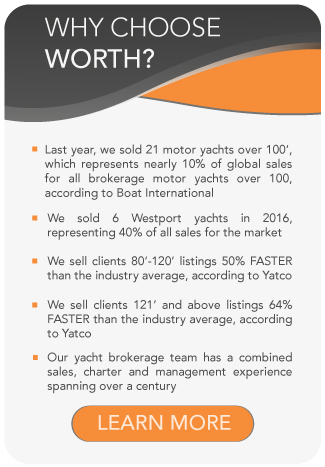 Worth Avenue Yachts created this unique resource to facilitate your next yacht purchase. You will find all the high-quality Pershing Yachts for sale on the market today worldwide. Pershing is an Italian yard, recognized for a great quality of build and exceptional performances. Yachts from the shipyard feature distinctive lines and a sporty look. Able to reach over 45 knots, they will take you to the Bahamas in the glimpse of an eye. The latest model features an Arneson drive, improving both speed and manoeuvrability. While at anchor a Pershing yacht transforms into the ideal base to launch water toys or simply enjoy the scenery in a luxury environment. The privacy of the bow area makes them particularly enjoyable for guests and the owner. Their wide swimming step allows creating a true contact with the water for larger groups and is ideal for entertaining. Contact us today to explore our available Pershing yachts for sale, or to discuss a Pershing new-build.